On Friday, May 15th, Creative Time and Central Park Conservancy will unveil Drifting in Daylight, a dreamy springtime pathway of art winding through the world’s most iconic park. Drifting in Daylight includes performative, participatory, and perceptual work by artists Spencer Finch, Alicia Framis, Nina Katchadourian, Ragnar Kjartansson, Marc Bamuthi Joseph, David Levine, Karyn Olivier, and Lauri Stallings + glo. Spencer Finch’s Sunset (Central Park) converts the heat of the sun into the cool of ice cream, distilling the colors of the Central Park sunset into soft-serve offered to passersby from a custom solar-powered ice cream truck. Spencer Finch brings the timeless practice of plein air painting to delectable new intensity with Sunset (Central Park). After painting a watercolor of the sunset over Central Park, Finch meticulously extracts its hues to color cones of soft-serve ice cream, served free to park-goers in a series of what the artist calls an “edible monochrome.” Each ice cream cone becomes a deliciously poetic gesture in reverence of summer sunsets. Finch’s featured work, Sunset, was previously presented at the Contemporary Art Museum of St. Louis by the Pulitzer Arts Foundation. The Brooklyn-based artist Spencer Finch, known for depicting the hues of the city’s sky for New York’s National 9/11 Memorial Museum, has again looked upward for inspiration. 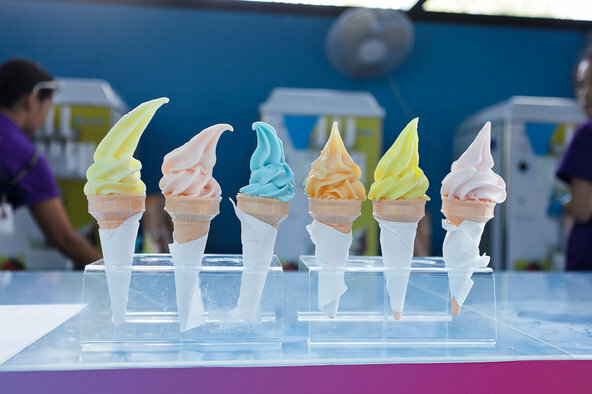 His “Sunset Soft Serve,” set near the park’s Conservatory Garden, will serve free sunset-colored treats from a solar-powered ice-cream truck.